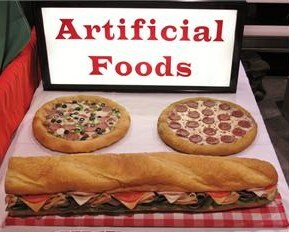 Fake Foods and More- Plastic Fake Foods In Stock. Realistic Food For Restaurant Display, Plastic Food Manufacturer with Replica Foods In Stock. We Have Fake Food Made in Arizona, Plastic Kale and Plastic Vegetables In Stock. Fake Chicken - All Chicken. Replica Salami For Display. 3 Pack Set. Replica Spiral Sliced Ham Custom Made. Replica Palm Tree Island Carrot Decoration. Various Artificial Foods We Carry. Welcome To Fake Foods and More. We Have A Large Selection Of Realistic Fake Foods In Stock. High Quality Fake Foods That Look Good Enough To Eat! Order Online or Call Toll Free 1-877-768-0722. Replica Plastic Kale. 12" Long Kale Strips. Washable Plastic Kale. Perfect for use in and around the salad bar. Plastic Kale Special: Save On 25 or 50 Packs. Price: Save on large plastic kale packs. We have a large supply of plastic kale in stock and you can save on large quantities. Replica BBQ Steaks. 1-1/2" Thick Grilled Fake Steaks. 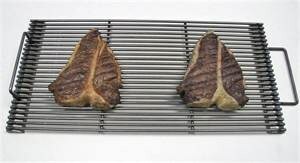 Price: Thick replica grilled steak $95.00. Replica thick grilled steaks with realistic barbecue charbroil lines. Replica BBQ Foods Hot Off The Grill Style. Price: Various replica barbecue foods. Replica Grilled Foods. Realistic fake barbecue meats and vegetables. Replica BBQ Rib Racks. Baby Back Ribs. Price: 2 sizes to choose from. Realistic baby back ribs cooked with barbecue sauce. 2 rib rack sizes to choose from. 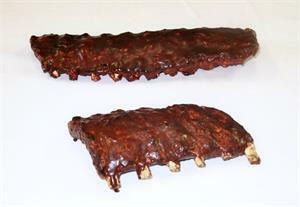 Price: Rack of replica spare ribs $96.50. 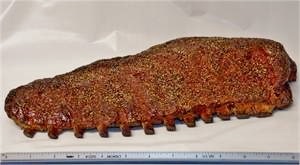 Large 15" rack of 3 pound size BBQ pork spare ribs. Looks good enough to eat! 2 piece replica chicken dinner with fries and corn. Replica Steak and Potato Dinner. Price: Replica steak dinner $145.00. Replica steak dinner plate for display. Replica Sub Sandwich For Sale. Price: 24" replica sub sandwich $175.00. 24" Replica Sub Sandwich On Display At The Show. 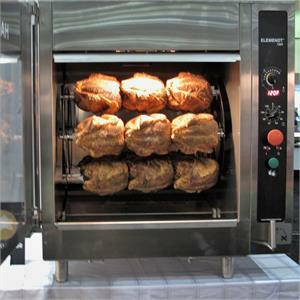 Replica Whole Roasted Chickens On Display. These replica roasted chickens looked fresh every day of the show. Save 20% Special. 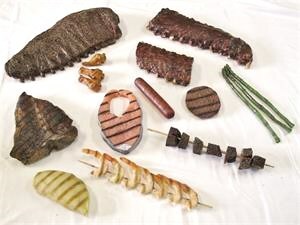 Order All 12 Grilled Style Replica Foods $481.95. Realistic grilled fake foods for a hot off the grill display. Save 25% On The 3 Item Show Special. Price: All 3 items $378.00. (2) 12" pizza's and (1)- 24" long replica sub sandwich. Save on all 3 items for $378.00. Realistic Replica Foods Made In The USA. For Questions or Sales Call Toll Free 1-877-768-0722. We Make Custom Made Fake Foods. Replica Combo Pizzas. 14" Combo Pizza $155.00. Replica Grilled Meats For Display. Plastic Kale 12" Strips. Pack of 25 Special. 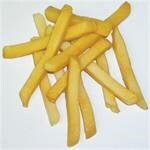 Pack of 12 Fake French Fries $39.50. 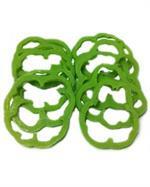 Plastic Bell Pepper Rings. 5 Colors Available.